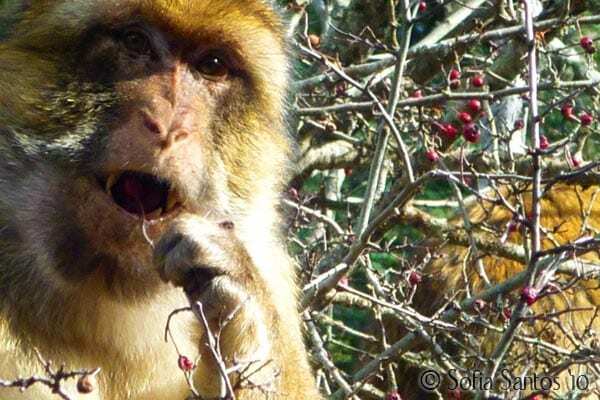 Foraging and feeding habits of the Barbary Macaques vary throughout the year in the Atlas Mountains and sometimes even between the groups that we work with. 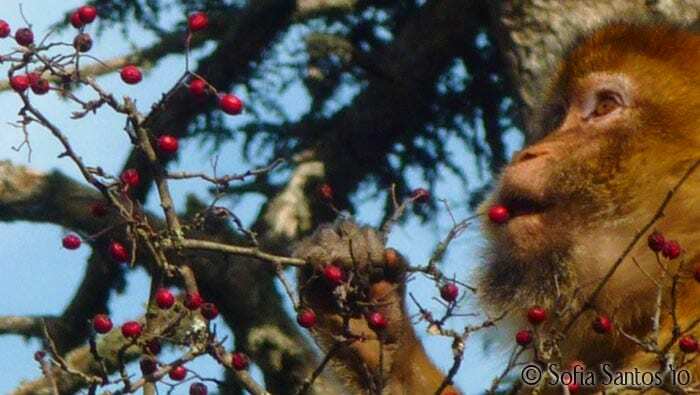 While during this time of the year the Green Group rely on food items like acorns, fungi and occasional roots and worms, the Scarlet Group seems to be intensely feeding on green grass and red berries. 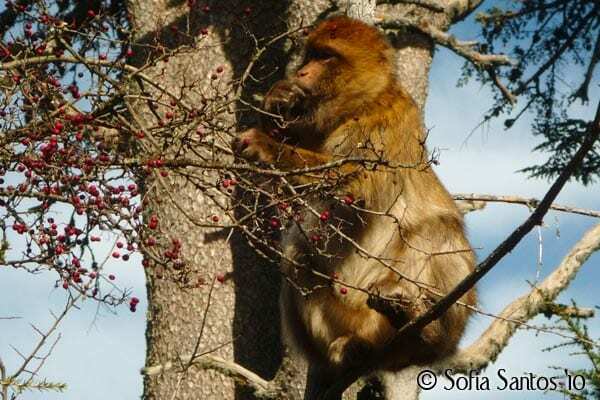 I’ve tried a quick search online in order to find out the correct designation for the specific type of berries they feed on so enthusiastically lately but it seems that there is not much information available regarding the types of berries that can be found in the Middle Atlas Mountains. They don’t look extremely appealing but the monkeys seem to be crazy about them. It’s quite hard to describe how they taste like (of course I had to try them many months ago as soon as I saw them in the forest). The closest flavour I can think of is apple, not too sweet, not too sour but a balanced taste of both. They have quite a big seed inside so most of the berry is not really edible but doesn’t seem to stop the group from enjoying them sometimes for hours in a row. Different strategies and group interactions can be observed during their berry delight. Because there are so many berry bushes available is quite rare to witness a fight for a specific food patch. They all seem to organize themselves without causing any problem or tension within the group. Some bushes are full of infants (mostly playing) and juveniles feeding whereas other bushes carry the big adult males and females. Juveniles usually jump around feeding here and there, chasing the better looking berries all around, sometimes even upside down while adults usually prefer to find a good spot (usually at the top) and reach for the berries nearby without too much effort. Young juvenile upside down holding on to a branch while reaching for a berry. One of the things that surprises me the most whenever I watch them feed on berries is their ability to stand or sit in an incredibly spiky bush without getting hurt. 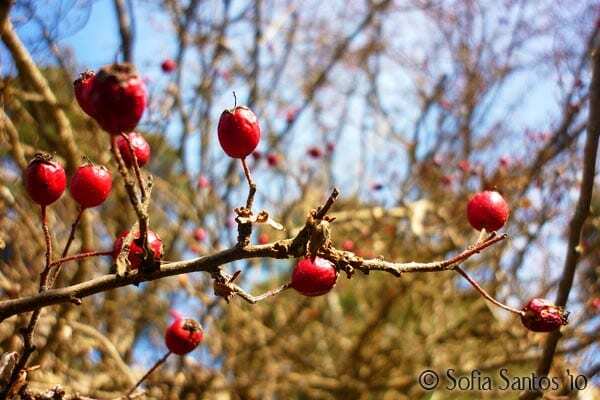 I can assure you that even my most cautions attempts to reach for a berry in the middle of the bush end up with me getting hurt and sometimes bleeding due to the sharpness of the spikes all over the berry bush. However that doesn’t stop them to just jump right into the middle of that human death trap! Sequence of Courtney’s jump into the berry bush. Although, like I just stated, they don’t seem to mind the spikes (or maybe they just assume it’s worth it) some members try different strategies like sitting in a nearby tree while reaching for the bushes without actually sitting on them. Hollie sitting in a tree while feeding on the berries just next to her. Other members will reach for a branch, rip it off and calmly sit on the ground feeding on the berries that just came with it without the hassle of having to deal with all the spikes. Apollo feeding on a berry branch. One of the things I usually try to spot is the presence or not of a hand preference while reaching and plucking the berries. So far it seems like they don’t show any specific preference for the left of right hand, they just use the one that seems the easiest at the time (my own assumption, not backed up by any scientific data, just pure observation and deduction). 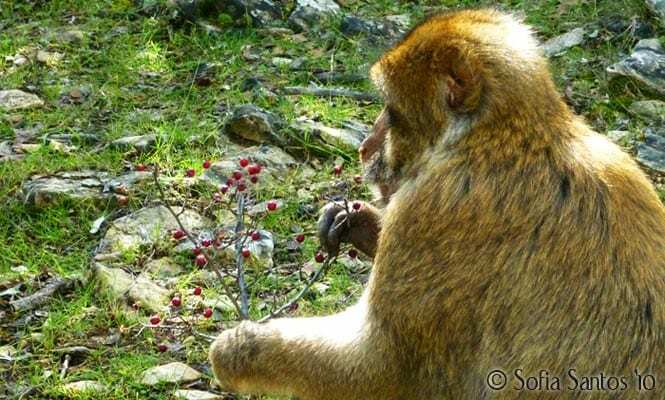 Different ways of getting the berries can be observed: the grabbing of the branch and bringing it close to the mouth while directly pulling the berries with the teeth, the once again grabbing and pulling the branch but instead, using the fingers to grab the berries one by one (usually the thumb, the index finger and occasionally the middle finger as well) and directing them to the mouth or just picking up berries from the ground using the hands. Video of Apollo feeding on berries on the top of a bush. 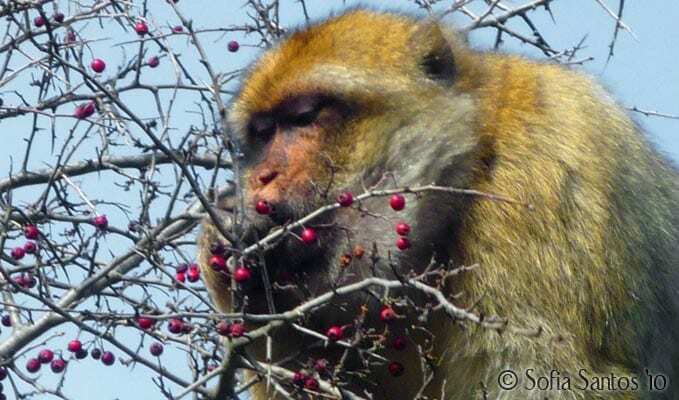 Overall the berries seem to delight the monkeys and keep them busy for hours during the day. 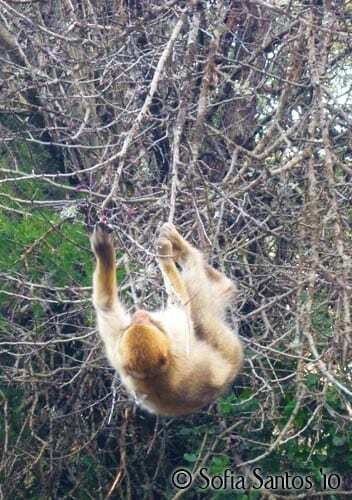 All the members feed on them at some point during the day and they produce the most funny crunchy sound due to the big seed inside making the monkeys easy to find in all the surrounding bushes just by following the crunchy noise. It’s amazing to watch them eat the berries so enthusiastically while we try to get some nice photos. The afternoon is the best time to get amazing pictures, the contrast of the blue sky, the red berries, the yellow/light brown coat of the monkeys and sometimes even the green from the trees in the background make an overall great image to store in memory and if we are lucky, in a nice photograph to share. Apollo at the precise moment the berry touches his tongue on the inside of his mouth. Hollie feeding on a berry while already spotting the next one she’ll reach for. Chuck at the top of the bush grabbing and pulling the berries close to him.